For the past three weeks, I’ve been pretty much driving the employees at the feed store crazy. Nearly every day, I called to ask if the buff orpington chicks had arrived. Every time, they’d say no. I debated several times if I should stop waiting and snap up my second or third choice breeds (Plymouth rocks or australorps) before they sold-out. In the end, I waited, and Wednesday when I called, the buff orpingtons had FINALLY arrived! 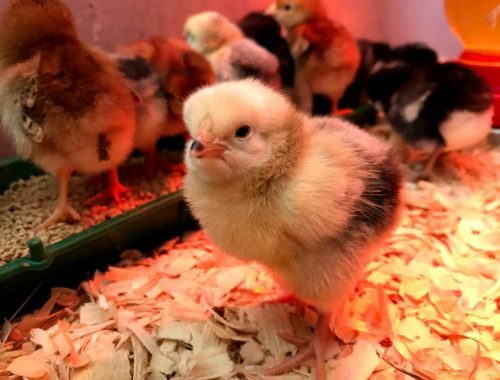 My first (and only) prior experience raising chicks was in 3rd grade, when our teacher Mrs. Nyman hatched chicken and duck eggs in our classroom. Being an animal-lover, I was completely enthralled by the entire process. Our class voted on names, and Mrs. Nyman wrote them in marker on each egg. 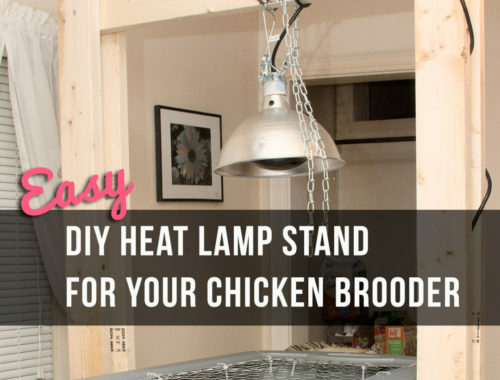 Then as the little chicks developed, she used the overhead projector (dating myself here?) to candle the eggs so we could see their progress. 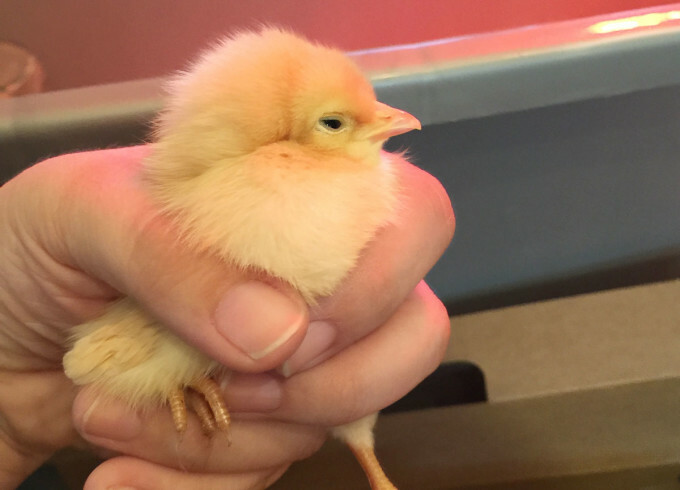 We were even lucky enough to see a few of the chicks hatch inside the incubator during school-hours. It made a HUGE impression on me as a child. Most of my classmates favored the ducks, but I ended up getting very attached to one of the chicks (a solid-brown one named Cocoa). I was pretty much heartbroken when my parents said I couldn’t bring home a chicken, and she went home with another girl in my class. 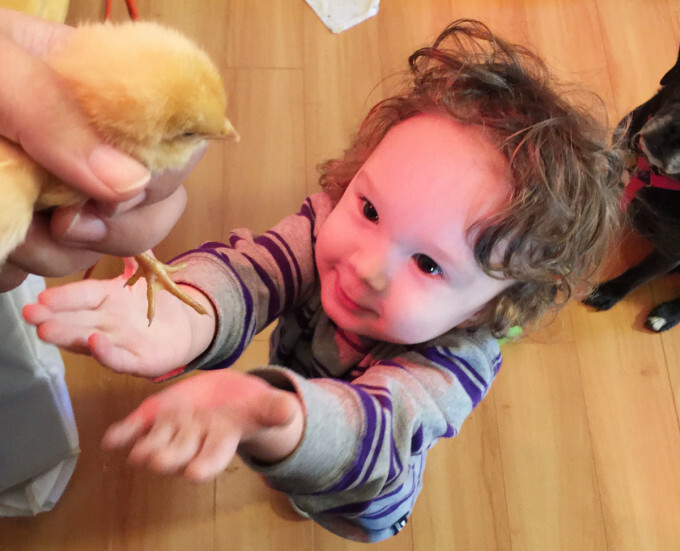 As an adult, I’m admittedly just as enamored with our chicks, but in a different way. 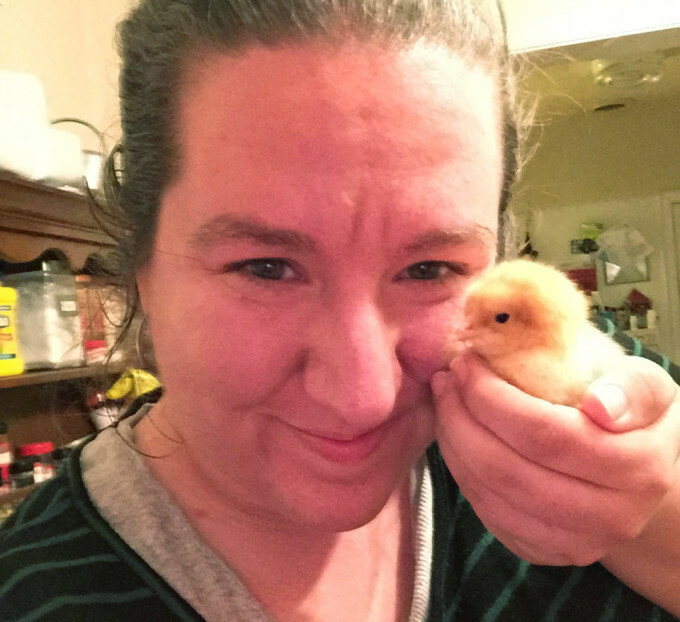 I’ve kept a LOT of different types of pets over the years: cats, dogs, parakeets, hamsters, mice, degus, ferrets, and fish (my childhood bedroom was pretty much a zoo) … but the chickens are different. I kept all my past pets for pleasure or entertainment, but despite their cuteness, I don’t see the chicks that way. In just a few months, these palm-sized, peeping balls of fluff will grow into big, beautiful birds that will provide hundreds of eggs for our family over the next few years. They’ll turn the soil where they free range and they’ll help keep the bug and tick population in check in our yard. Their manure will be put to work in our compost pile, then help grow vegetables in our garden. And what do they ask for in return? A safe shelter, simple foods, and clean water. It’s a more than generous trade-off. Chickens are amazing creatures when you take the time to think about it. When I hold one of those tiny chicks, it is awe-inspiring to think of the gifts that little life will bring to our home and our family. I feel fortunate to be the keeper of our little flock, and I’m really looking forward to teaching my boys to care for and appreciate these animals. Yup, he’s pretty smitten with them too. 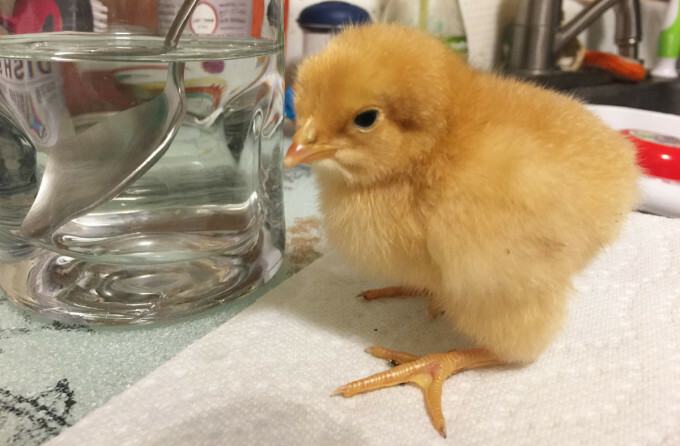 Awwww… I have two Buff Orps and a Golden-Laced Wyandotte. My Orps are super sweet! Have fun with your flock… nothing is better than home-grown eggs!